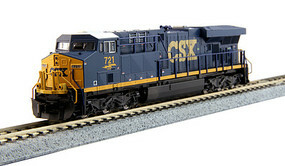 Shop online for over 7,200 model train locomotives at discounts up to 63%. Diesel - HO is the most popular of the 15 model train locomotives categories, then Diesel - N, and Steam - HO. Bachmann is ranked #1 out of 35 model train locomotives manufacturers, followed by Atlas, and Intermountain Railway Company. This is the EMD F7 A Undecorated in N-Scale from Kato. Undecorated EMD F7A (freight style) for custom painters to create their own road name and number releases. This is the N Scale Diesel EMD FP7A Phase II - Pennsylvania from Model Power. Suitable for Ages 14 & Older. This is the HO Scale DCC Southern Alco RS-3 Diesel Locomotive (#2735) by Bachmann. Suitable for Ages 14 & Older. This is the HO Scale Pennsy F2-A Diesel Locomotive (#5772) from Model Power. This is a Prairie 2-6-2 Southern Steam Engine & Tender from Bachmann Suitable for Ages 8 & Older. This is the HO Scale DCC Ready Grand Trunk Alco S4 Diesel Locomotive (#8087) by Bachmann. Suitable for Ages 14 & Older. This is the HO Scale Southern EMD GP50 Diesel Locomotive (#9014) by Bachmann. Suitable for Ages 14 & Older. This is the HO Scale Diesel Dress-Up Kit - Athearn F7A and B from Walthers. This is the HO Scale DCC Union Pacific EMD DD40AX Centennial Locomotive (#6900) from Bachmann. Suitable for Ages 14 & Older. This is the HO Scale DCC Equipped CSX (Dark Future) GP38-2 Diesel Locomotive (#2511) by Bachmann. Suitable for Ages 14 & Older. This is the HO Scale Baltimore & Ohio F7-A Diesel Locomotive from Bachmann. Suitable for Ages 14 & Up. This is the HO Scale Nickel Plate 2-8-4 Berkshire Steam Locomotive with Tender (#759) from Bachmann. Suitable for Ages 14 and Older.